Trauma Drama – “PS I Love You has done nothing to educate consumers,” he wrote, when asked to provide content for a Petite Sirah story about to be written. I was aghast. This is someone who’s closely watched PS I Love You for the last 14 years, and someone who has make some promises, but then has forgotten. His thoughts may go to press, as his perception. My perception is quite different, having actualized and gathered data since 2002. I respect his right to freedom of speech, and am therefore responding, if it’s going or has already gone to print. Being on record presents the other side of the debate. Facts and figures provide a very clear reality. In 2002: There were 62 Growers and Producers combined. 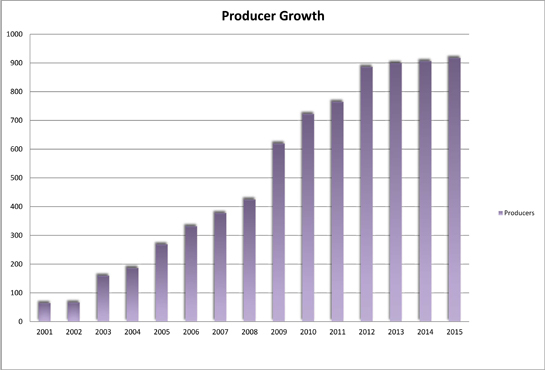 In 2015: There are 1,083 Growers and Producers combined. 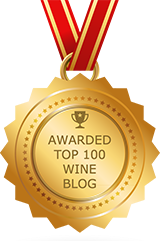 The percent of growth, for wine companies who now dare to make a Petite, is 1,646.77419…%. 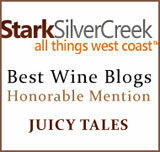 So, we’ve chronicled all stories on Petite Sirah on the PS I Love You Website. 2002 – nine stories are recorded, as soon as we decided to make it happen. If these stories were about one single Petite Sirah producer, especially if not a member of PSILY, the story was not recorded. 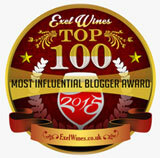 This year has been slight, because the Board of Directors and I stopped querying wine writers. You can see what happens when that activity goes away. We should have twice as many stories by now. That activity went away, because I always work many more hours than what compensation exists, within the budget. We are the world leader in Petite Sirah. Grape vine planting continues a slow and steady climb, as nurseries respond to supply and demand that they see happening, and by reports by agencies who predict what’s popular. I question those agencies’ understanding of what’s really going on. Producers need to push harder, because they love Petite, ask for it, and then turn away when it isn’t in the nurseries. Which variety is going to get the most attention and obvious purchases? Which ones need no advocacy group, as they’re quite established? Zin is a new comer in preference, as compared to Cab, Merlot, and Pinot Noir, so ZAP exists. With only 80 members per year, what would happen if every single wine company that has Petite Sirah actually supported the cause? From 80 to 1,083… We would soar. How do I know this? Because it takes money to make money; i.e., grow everyone’s awareness of Petite with ads and more events. Therefore selling more Petite, as this one critic desperately wants. WINE TRADE The Blue Tooth Tour, for two years: Concannon had a budget of $300,000 the first year for PSILY, and $180,000 for the second year. CONSUMER EDUCATION: Dark & Delicious now takes awareness to consumers, for the last nine years. Is the movement growing, based on the facts and figures? Column is gone, but archives remain. I must have been ahead of my time–mtd. Petite sirah isn’t petite Wines: Once considered a no-account, unsophisticated grape, petite sirah may be gaining fans among savvy consumers who know a good value when they taste one. The petite sirah grape is neither petite nor is it syrah. That much we know. 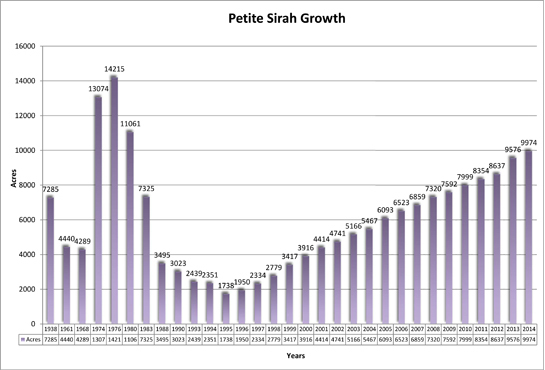 Petite sirah, sometimes spelled petite syrah, is a mystery grape with a shady reputation. It’s been hanging out in the vineyards of California for some time, producing burly red wines that delicate palates dismiss as crude. During the 1980s, the conventional wisdom was that petite sirah was actually the French durif — a coarse, thuggish wine variety in its own right. But that theory has come into question. Now petite sirah’s origins are even more mysterious than those of zinfandel, which was recently “outed” as Croatia’s plavac mali. For years, the rap on petite sirah has been that it is a low-class, no-account, unsophisticated grape even more southern (south of France, that is) than its distant relation, the noble syrah, which produces such widely adored wines as Hermitage and Cote Rotie. The assumption in recent years has been that the true syrah would inevitably nudge aside the remaining petite sirah vines. And in fact, many acres of venerable petite sirah vines have been uprooted to make way for more fashionable varieties on younger vines that will produce more tons of grapes. It’s a shame, because petite sirah is a grape with its own distinctive character. It produces concentrated red wines that typically display flavors of blackberry, game, coffee and chocolate. It also often shows a “dusty” quality that is an acquired taste. Among grape varieties grown in California, only cabernet sauvignon can rival its aging potential. Fortunately, petite sirah has always had its friends — a stubborn band of winemakers who understand that the variety is capable of making extremely flavorful and concentrated red wines with enormous aging potential. They see California’s dwindling acreage of old-vines petite sirah as a viticultural gold mine, and they’re digging for all they’re worth. Wine retailers say they’ve noted increased interest in petite sirah in the last few years. 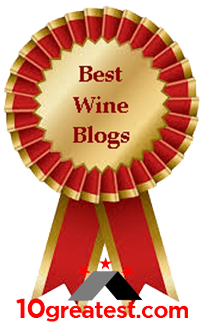 Apparently, some savvy consumers have noticed that some petite sirahs — notably those of Guenoc, Foppiano, Bogle and Concannon — are among the best red-wine values on the market today. This increased interest has inspired some producers to go for the gold with petite sirahs costing $20 and up. Some of these wines are very impressive. It’ll be interesting to see whether people buy them. 1991 Foppiano Reserve “La Grand Petite” Petite Sirah, Napa Valley ($24). This enormous wine still needs a decade to show at its best, but its combination of concentration and complexity suggests it could be California’s answer to Chateauneuf- du-Pape. 1994 Elyse Petite Syrah, Napa Valley ($22). This huge, ripe, soft-textured wine adds a splash of blueberry to petite sirah’s typical palette of flavors. It’s a very young wine that you can drink now, but it requires a few hours of breathing. 1993 Guenoc Petite Sirah, North Coast ($14.49). Guenoc’s 1993 and 1992 have previously been recommended in this space as extraordinarily complex wines for relatively moderate prices. 1992 Ridge York Creek Petite Sirah ($21). A 5 percent splash of zinfandel adds a touch of class to this typically excellent wine from Paul Draper, one of petite sirah’s most passionate advocates. 1994 Concannon Petite Sirah, Central Coast ($11). Concannon’s bargain-priced effort is surprisingly easy to drink young, but it’s no wimp. There’s plenty of structure behind the fruit, but I would drink it over the next two years rather than keep it for a decade. 1994 Bogle Petite Sirah ($9). The Bogle is an unusually soft-textured petite sirah that doesn’t have as much of the “dust” flavor as most of these wines. It’s a good wine for beginners who want to get to know petite sirah. 1992 Foppiano Petite Sirah, Sonoma County ($12.49). This burly, earthy giant is a bit coarse and closed, but it has a generous heart. A little heavy breathing should “gentle its condition,” and it could age for up to a decade. Michael Dresser’s column appears every other week in this section. Readers may write to him in care of The Sun, 501 N. Calvert St., Baltimore, Md. 21278. Please include a daytime phone number. Thanks, Michael. I’ll move this to the PS I Love You site in our blogs, because it couldn’t be more timely. Thanks for sharing!